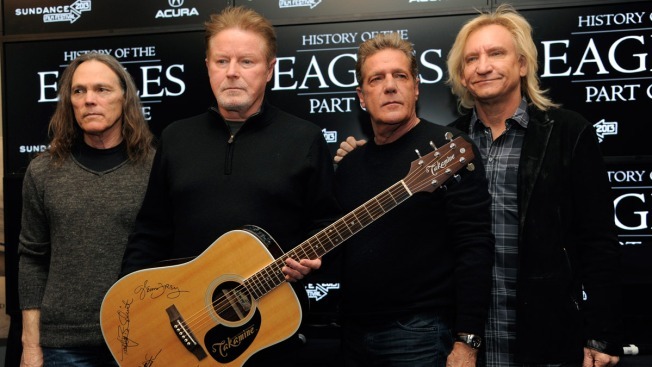 The band says the hotel wrongly led guests to believe it's associated with them and served as the inspiration for their hit song, "Hotel California"
In this Jan. 19, 2013 file photo, members of the Eagles, from left, Timothy B. Schmit, Don Henley, Glenn Frey and Joe Walsh of The Eagles pose with an autographed guitar after a news conference at the 2013 Sundance Film Festival, in Park City, Utah. The band is suing a Mexican hotel named the "Hotel California," claiming its capitalizing off the band's hit song of the same name. The Eagles are suing the owners of a Mexican hotel named Hotel California, claiming it's capitalizing off the band's hit song of the same name. The band filed a federal trademark infringement lawsuit Monday against the U.S.-based owners of Hotel California in Todo Santos, a town on the Pacific Coast near the southern tip of Mexico's Baja California Sur. The Eagles say Hotel California has wrongly led guests to believe it's associated with the Eagles and served as the inspiration for their song "Hotel California," which the band says isn't true. The hotel website says that the owners don't promote any association with the band but that visitors are mesmerized by the "coincidences" between the hotel and the song. The hotel didn't immediately respond to a request for comment Thursday.